It’s been a few years since we last looked at Kushi-Q and its yakitori. Although its 3rd Ave. location shut down in 2010, the Citigroup Center food court location (at 53rd and Lex) is still going strong. One of Zach’s biggest complaints about the place in 2010 was that it was kind of pricy for the amount of food you actually got. 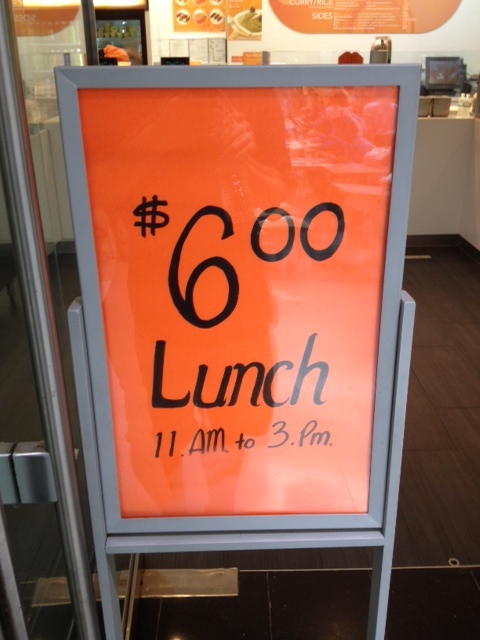 Now, they’re trying to appeal more to low budget lunchers with a $6 special. Interestingly, the lunch special does not at all apply towards their signature meat sticks, but only a newer selection of Chinese offerings. 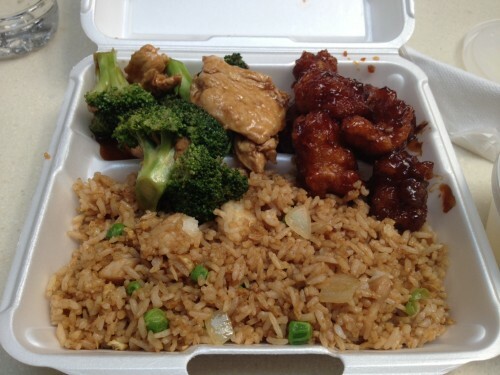 They have a steam table towards the side with white and fried rice, lo mein, fried dumplings, General Tso’s, chicken and broccoli, beef and broccoli, kung pao chicken, and maybe a couple other dishes. The soup wasn’t really anything special. It was maybe a bit thin and could have used more egg in it. It didn’t have a particularly distinctive flavor, good or bad. It was just kind of bland. 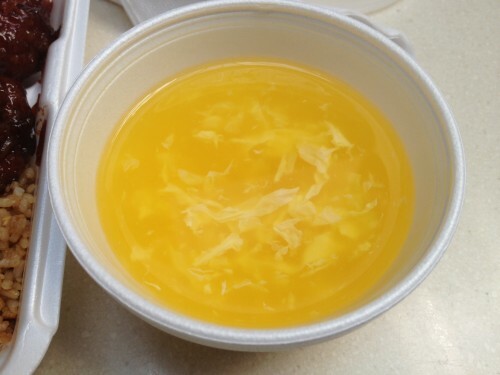 That’s fine though; I didn’t come here for the egg drop soup. The fried rice was pretty good! It had plenty of bites of pork, which was a nice touch. 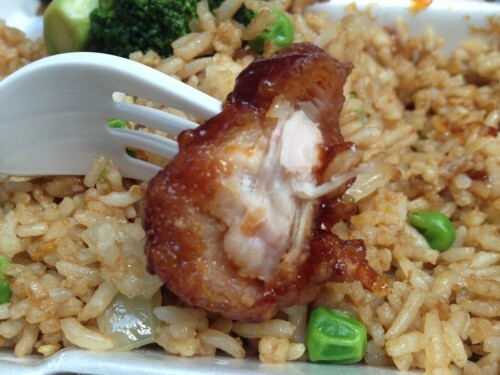 The General Tso’s had very sweet, barbecue-like sauce, so it wasn’t the least bit spicy. When eating the stuff, I tasted a lot more of the fried coating than I did actual chicken meat, which could be good or bad depending on your outlook. I usually prefer my Chinese food broccoli to be soft and doused in some sort of brown sauce, but this broccoli had more of a fresh, raw taste. The chicken that came with it was super thin, but still flavorful. The portions seemed a bit meh (not much of either main course), but I’ll admit that I was full after eating the whole plate. 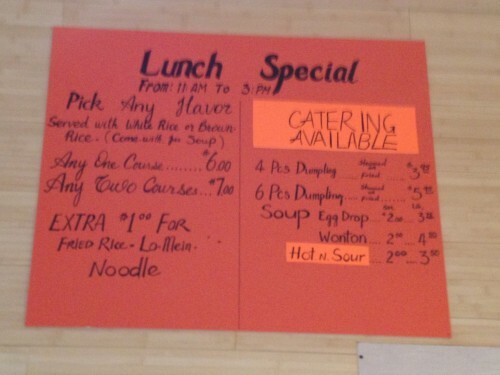 I’d hope that they serve more than I got of each main course if you only order one, but I can’t say for sure. Overall, the food definitely has a food court vibe and taste, but it’ll probably satisfy any Americanized Chinese food cravings you have. I’d suggest avoiding a customized order like I made and sticking to something basic. For $6, Kushi-Q has an alright deal, but once you start approaching $8, the value is questionable. Posted by Chris Thompson at 11:30 am, September 5th, 2013 under Kushi-Q. what YAKITORI? this place is chinese…. Well, they certainly sell Chinese food now (see review above), but I’m pretty sure that’s not their main focus. Check out their website (http://www.kushi-q.com/). It’s got ‘Japanese’ written all over. 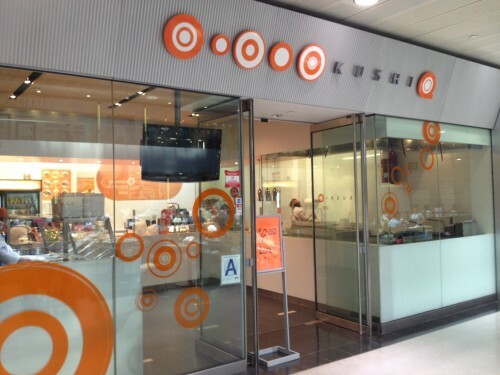 Kushi-Q used to only serve yakitori (and curry rice), still visible on the right side of the space. 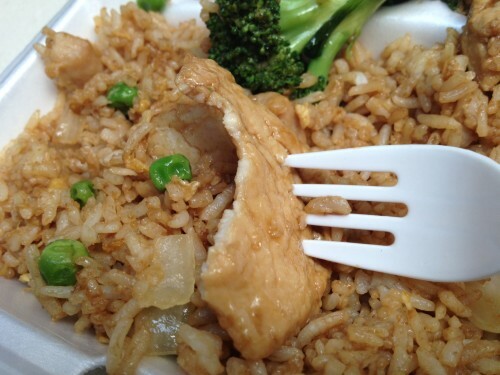 Recently they added the steam table with Chinese-style dishes that are the subject of this review. A few months ago I tried the lunch special with 2 items. At 2 pm the pickings were slim, and had obviously been sitting out a while. However, I’d go there again, since, as the reviewer states, it’s fine in a food court sort of way. Join the Midtown Lunch photo group and add your own photos!